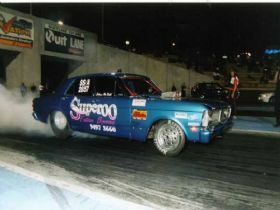 Superoo Falcon Spares commenced trading seventeen years ago due to my passion for everything Ford. After a year and half we moved to our current location at 5 Burns Road, Armadale, Western Australia. We have two large sites that accommodates our stock of cars we are dismantling, NOS (New Old Stock) parts, new reproduction parts and a massive range of parts on shelves ready for shipment. We also provide Ford performance parts, we recondition some parts and supply new replacement parts and have over 7,500 new part numbers on our system. I have built a team of seven staff who share my passion for Fords and have a vast knowledge of the Ford parts industry which allows us to help customers with their requirements not only in Australia but overseas as well. We ship parts locally, nationally and overseas on a daily basis. 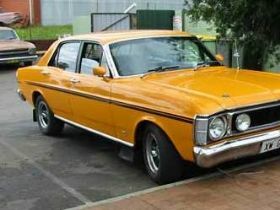 Superoo Falcon Spares specialises in Australian Ford models and we have over 300 cars on site that we are dismantling. We have some late 1950s models, everything in the 1960s, 1970s through to early 1980s cars and parts. We have all the parts for the popular muscle cars of the late 60s and early 70s and we have been acquiring parts and cars for many years. A lot of our Australian stock is shelved, ready to go allowing us to provide our customers with a quick turnaround time on orders. We have a huge collection of Ford NOS parts, possibly the largest in the country that encompasses models from XK to XE. 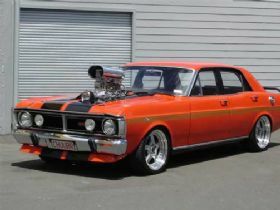 Included in this inventory are over seven hundred and fifty NOS panels and a huge shelving unit that measures eight meters wide by two metres high and deep that is full of original Ford boxed parts. Over the years we have acquired peoples collections and also purchased a number of country Ford dealers parts stock so if you have a requirement for a specific original part or are doing a concourse restoration give us a call as we probably have the parts you are looking for. 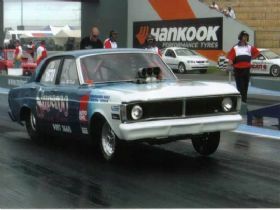 Superoo Falcon Spares can also supply 1960 and 1970 model American Ford parts for Mustang, Fairlane and Galaxie models. We do have some of these parts in stock and we provide reproduction parts for the American models and can source anything a customer requires at competitive prices. For performance oriented Ford enthusiasts we have a huge range of differentials and axles including all the popular nine inch components ranging from clutch packs to 6.0 gear sets. We have a lot of dress up gear for the engine compartment and a selection of four valve cylinder heads and a huge variety of carburettors in stock. 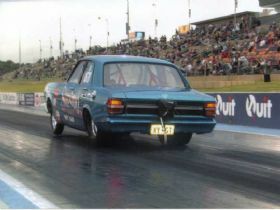 We support three local drag racers involved in the Perth drag racing scene and sponsor a car involved in circuit racing at Wanneroo. One of our staff is part of the pit crew for a local Top Comp car and the experience and feedback we get from these activities helps us to provide knowledge to customers looking to prepare their own Fords for racing. 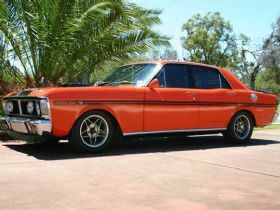 I personally own a Ford XW GT, an XY GS and a 67 American Fairlane. We offer a discount to any customers who are members of Ford Car Clubs and strive to provide a personalised service to everyone making an enquiry regarding parts. Over fifty percent of our business comes via phone or our e-commerce system so there are a number of ways you can do business with us. Our staff are available from 8.00am to 5.00pm Monday to Friday and Saturday from 8.00am to 1.00pm. By phone we can provide availability and pricing information and to make payment easy for customers we provide Bankcard, VISA, Mastercard, EFTPOS, Cash on Delivery, Money Order and Electronic Bank Transfer facilities. We also have a comprehensive e-commerce site that is available twenty four hours a day, seven days a week that is easy to navigate through and provides detailed parts descriptions and pricing by product group. You can order directly on line, add one or multiple items to your shopping cart and the orders are processed on the next business day. We ship products by a number of different means, normally depending upon size, weight and customer urgency. For smaller parts we use Australian Air Express, for large boxes, cartons and pallets we use TNT Road Freight and we have shipped whole cars by a variety of carriers in consultation with the customer. So if you are looking for new, second hand, NOS or rare parts and would like to deal with a company that has a massive range of Ford spare parts in stock supported by many years of experience and knowledge check out our website or give us a call and we will gladly help you with your Ford parts requirements.